When you use a Chromebook, you use Chrome as your browser to browse the Internet. Learn how to get around in Chrome by studying the picture and terms below. Apps Launcher: Docs, Sheets, Presentations, etc. can be found here when you sign in. Bookmarks: Bookmark important or favorite websites by clicking on the star. You can show/hide the Bookmark Bar by going to Chrome Menu, Bookmarks. Chrome Menu: You can change the magnification, access bookmarks, manage extensions, change settings, etc. here. I'm Feeling Lucky: Click here to go directly to the first result of your search. Omnibox: You can type in search terms or a web address here. Search Box: type in your search terms here. 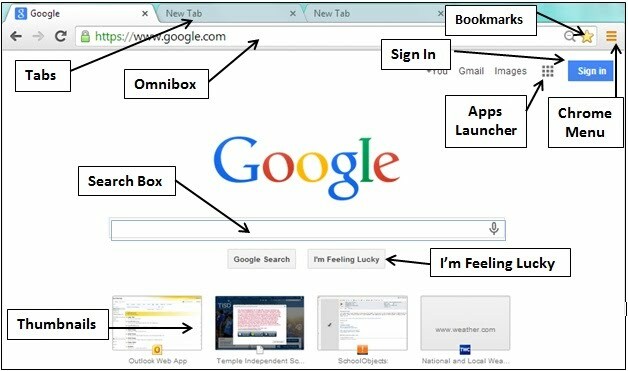 You can also use the Omnibox to search. Sign In: sign into your Google account(s) here. If you don't see the Sign In button, go to www.google.com or www.drive.google.com. Tabs: Use tabs to manage the windows, or web pages that are open. You can pin tabs you want to stay open by right clicking on the tab and choosing "Pin Tab". Thumbnails: sites that you visit frequently. You can remove thumbnails by clicking on the X in the top right corner of the thumbnail.